A vintage that saw rain in late September, the 2008 Syrah Cailloux Vineyard is a co-fermented blend of 90+% Syrah and the balance Viognier, that wasn’t harvested until October 10. Hitting 14.1% natural alcohol, it’s drinking beautifully today and offers a meaty, iodine, peppery and plum-pit bouquet to go with a full-bodied, refined and elegant feel on the palate. It shows more and more floral and rose petal qualities with time in the glass, has plenty of mid-palate depth and will have no issues evolving for another decade. The Wine Advocate - A vintage that saw rain in late September, the 2008 Syrah Cailloux Vineyard is a co-fermented blend of 90+% Syrah and the balance Viognier, that wasnt harvested until October 10. Hitting 14.1% natural alcohol, its drinking beautifully today and offers a meaty, iodine, peppery and plum-pit bouquet to go with a full-bodied, refined and elegant feel on the palate. It shows more and more floral and rose petal qualities with time in the glass, has plenty of mid-palate depth and will have no issues evolving for another decade. 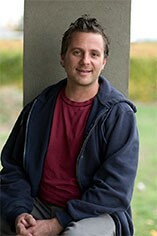 Cayuse Vineyards is one of the leading wine producers in Washington State, owned and run by Frenchman Cristophe Baron. 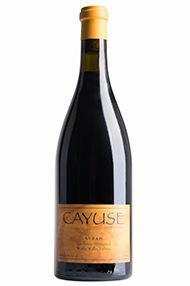 Cayuse's single vineyard Syrahs have become incredibly sought after and are compared with the finest wines from the Northern Rhone. Christophe Baron grew up among the vineyards and cellars of his family's centuries-old Champagne house, Baron Albert and became the first Frenchman to establish an estate domaine in Washington State. While visiting the Walla Walla Valley in 1996, Christophe spotted a plot of land that had been plowed up to reveal acres of softball-sized stones. He became ridiculously excited. This stony soil, this terroir, reminded him of vineyards he had visited in France and Spain. The difficult ground would stress the grapevines, making them produce more mature, concentrated fruit. Christophe Baron had found a new home. The majority of the vineyard is planted with Syrah, and the rest dedicated to Cabernet Franc, Cabernet Sauvignon, Grenache, Merlot, Tempranillo and Viognier. All of the vineyards are planted in rocky earth within the Walla Walla Valley appellation. Cayuse is also the first domaine in Walla Walla to farm using biodynamic methods. Washington State was effectively a 'dry-state' producing only grape jelly, until the 1980s spawned a wine industry desperate to make-up for the lost time. In 2004 plantings were at 12,141ha (up 4,000ha since 2000). Columbia Valley AVA dominates with approx. 60% of total vineyard area; the prized sub-region Yakima Valley AVA covers 39%; Walla Walla Valley AVA 1%. Lying to the east and in the shelter of the coastal Cascade Mountains, the region enjoys a dry, distinctively continental climate, where Cabernet Sauvignon and Merlot blends can reach great heights on the sandy gravely loam soils; Semillon and Riesling are the most promising white wines. In 2005 there were approx 350 wineries (a 10% increase year on year), with the Andrew Will Winery regarded as the region's best.